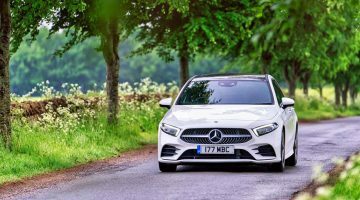 While few of us at evo have ever had much enthusiasm for the previous A45 AMG, that’s not to say we don’t acknowledge its place in the history of the genre. In terms of power, performance and pricing it sent the numbers soaring. Moreover, the car also shifted preconceptions internally at Merecedes-benz, and crucially, within AMG. Far from being a dangerous stretch downwards of the Affalterbach brand, the ‘45’ family eventually sold twice the number of AMG’s original, and as it turned out, rather pessimistic prediction. 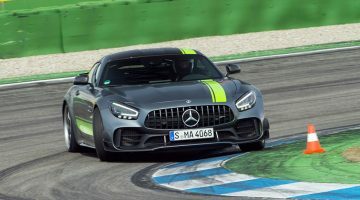 Therefore, this time around AMG has shifted tactics and invested more money. This new A35 model is the more accessible younger brother, aimed squarely at the hugely successful Golf R. That leaves headroom for an even more extreme, and expensive, A45 in due course to push the boundaries at the pinnacle of the hot hatch market. But has AMG managed to incorporate more finesse this time into its new ‘junior’ hot hatch? The A35 uses a heavily-developed version of the M260 engine used in the A250 hatch, not the M133 engine familiar from the old A45. For this application the standard turbo has been replaced by a twin scroll item, and the intake air is cooled via an air-water intercooler, not the A250’s air-air type. Its 302bhp just shades the (recently downgraded due to WLTP regs) Golf R’s 296bhp, and is complemented by 295lb ft of torque. Combined with a twin clutch, seven-speed gearbox and four-wheel drive, it’s no surprise that the performance figures are strong: 0-100kph takes just 4.7-seconds, and the top speed is 249kph. Virtually no component in the car’s suspension is carried over from the regular A class, with re-designed joints and lower wishbones combined with careful development of the bushes and even the use of metal bearings on the lower front arms for more steering precision. The rear subframe is now solidly mounted to the body, while the steering rack is also new for the A35, as are the beefy brakes with monoblock four piston calipers up front. There’s a stiffer structure to work with, too, courtesy of an aluminum shear under-panel beneath the engine, assisted by bracing bars. The four-wheel drive system now uses an electro-mechanical clutch on the rear axle, unlike the hydraulic system on the A45, for quicker responses. The A35 is 100% front-wheel drive in steady running, but up to 50% can be sent to the rear axle. 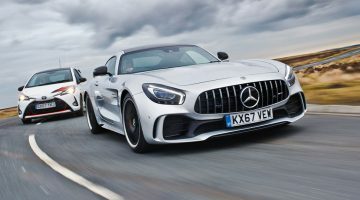 There are five driving modes (Slippery, Comfort, Sport, Sport+ and Individual), and in the more aggressive of these settings the AMG Dynamics system uses the ESP and torque vectoring to aide corner turn-in. There’s a bespoke tyre for the car, too: a 19” Pirelli P Zero. Squat, punchy, and looking every inch the upmarket German hatchback fed protein shakes, it’s immediately obvious the traditional ‘hot hatch’ label is going to woefully undersell a car like the new A35. In the metal, to my eyes at least, the design is more cohesive than the old A45, and the optional aero kit now better integrated – if no less attention-grabbing. Open the driver’s door and settle into the optional AMG bucket seat, and the giant one-piece slab of MBUX tablet display (yep, that’s also optional…), fancy neon-esque interior lighting, swathes of aluminium, Alcantara and AMG’s new steering wheel with its own driver mode, damper and ESP switch, all position the A35 in a totally different orbit to more traditional examples of the breed. But what really matters is how it drives, and first impressions are quietly promising. In ‘Comfort’ the A35 is reserved, and there’s confirmation that the engineers’ work to broaden the range of suspension settings has been at least partly successful: it’s still a firm riding car, but even on the amazingly smooth roads of our test route you can sense there’s pliancy here. The steering is light and relatively mute in its feedback, but it’s also nicely progressive and accurate – the car heading exactly where you place it. Switch to a more aggressive setting and the A35 shifts character considerably. The exhaust opens up and the motor chomps enthusiastically through the gears, although there’s a hint of lethargy in the mid range. It’s hard to say exactly why this is – the A35 certainly isn’t a light car, but perhaps it’s because by their own admission AMG has mapped the engine to maintain power at high revs, so you do need to wring it out to feel the full force of its performance. Driven hard the A35’s immense traction, impressive braking powers and undoubted agility mean it covers ground at an astonishing rate. It’s a more grown-up experience than the terrier-like hot hatches of old, but it does feel hugely capable. It’s just a shame the aforementioned roads were so smooth – a great hot hatch needs to work on everything from a perfect racing track to a gnarly B road, and in this regard, although it shows promising signs, it’s too early to really say whether the A35 can master these diverse disciplines. At $45,442 the A35 is only slightly more than a VW Golf R DSG 5-door ($44,586), but perhaps even more than the Golf, its price can be inflated significantly with options and personalisation items. There won’t be many that leave the showroom for under $51,000, and $64,000 should be quite straightforward. A lot of money, but then the A35 does feel like a lot of car.